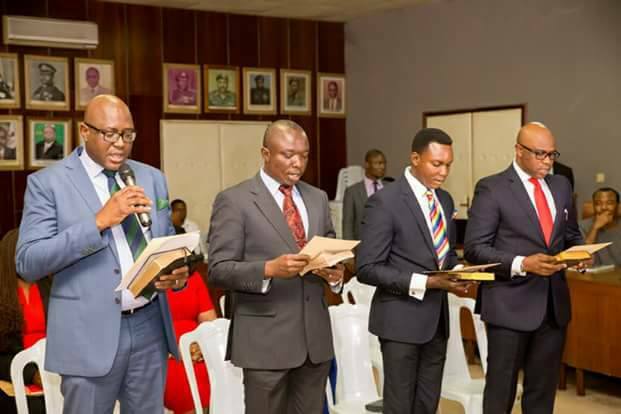 Edo State governor, Mr Godwin Obaseki on Monday swore in the new Chairman and members of the board of the Edo Internal Revenue Service (EIRS) at The Government House in Benin City. Governor Obaseki, congratulating them on the appointment, charged them to be professional and meet up with budgeted revenue targets. He commended the immediate former Chairman and members of the board for the level of patriotism and professionalism displayed during their tenure. Meanwhile, the governor also called on the new board members to build on the already established benchmark of their predecessor. In his response, the Chairman, Mr Igbinidu Inneh, appreciated the governor for the opportunity given to him and other members of the board to oversee revenue collection in the state. Inneh also praised his predecessor and former members of the board for repositioning the revenue service in the state. He promised that the new board would live up to its expectations, be accountable and sustain taxpayers’ confidence. He said that the board would execute its task with six principles: legal and regulatory, availability of data, human capital capacity, technology selection, Enlightenment and social inclusion and value for money for optimal performance.